I first learned of Margo Lanagan's existence when her previous novel Tender Morsels won the World Fantasy Award in 2009. I picked up the book from the library, started it, and eventually put it down again. The beginning of the book is horrifying and bleak, as many a review commented at the time, and I wasn't in quite the mood for it then. 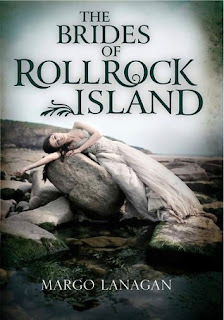 Having read Lanagan's newest book The Brides of Rollrock Island (just released at the beginning of the month), I'm definitely going to have to try Tender Morsels again and track down Lanagan's earlier fantasy short story collections. The Brides of Rollrock Island, originally published in novella form as Sea Hearts, contains a version of the Celtic selkie myth - women who rise out of the bodies of seals to marry men on land, but who, if they put their seal coats back on will return to the sea once more - and it's a heartbreakingly beautiful novel about persecution and revenge, love, betrayal, and sacrifice. The conflict - the bringing of the sea wives to Rollrock Island by the witch Misskaella - plays out over three generations or so, which reminded my Bronte-saturated mind of Wuthering Heights. Structurally, this book is interesting because it makes use of so many viewpoints. The sea witch Misskaella, who would technically be cast in the role of the villain, narrates for an extended period of time, and as a reader, I sympathized with her and was saddened to discover what becomes of her later in the book. I was happy to follow each new voice and curious to figure out how they fit into the story, as each new section creates a not unpleasant shift and jar in the narrative - the reader needs to keep their wits about them. The reader never has direct access to the sea wives' minds, but their sons and husbands tease out their love for their families on land and their grief for the loss of their seal-selves, their seal-children, and their home beneath the waves. The novel ends with loss and sacrifice and also catharsis, all of which made me highly teary-eyed. As a richly poetic and atmospheric novel, this book is perhaps not your traditional page-turner, but the story and the characters held me so tightly that I had to stay up until 3 in the morning to finish, to find out what happened to the sea wives, their husbands, their children, and the witch who had set everything in motion. Highly, highly recommended. I agree with that 'highly, highly recommended'. I just finished 'Sea Hearts' (The Australian title for 'The Brides of Rollock Island') and I loved it - it's left me a little bit dazed and stirred - as Lanagan's writing tends to do. Good luck with your thesis and enjoy Oxford! Thank you! PS Are you familiar with Lanagan's short story collections? Is there one best to start with?